Atlantic 10, meet Samir Doughty. Samir Doughty, meet the Atlantic 10. VCU’s redshirt freshman and the only remaining member of Will Wade’s first recruiting class put on a show last night. The Philadelphia native went all Philly on Duquesne in his home state and posted career-highs in points (23), assists (9) and steals (3) and added seven rebounds in the win for good measure. It was Doughty’s second career game playing more than 30 minutes and he rewarded Will Wade for the confidence with the best game of his young career. Doughty came into the season having posted solid numbers during the Rams summer tour of Spain and is now carrying that over into VCU’s regular season, a much-needed consistent scoring addition to a Rams roster that’s been forced to adjust to the losses of Melvin Johnson and Korey Billbury to graduation and most recently, having to adjust to a broken foot from explosive freshman De’Riante Jenkins. FUN FACT: Doughty’s big night in Pittsburgh basically matched his senior-year high school averages (according to MaxPreps) of 24.9 ppg, 9.7 rebs, 4.1 asts and 2.7 steals. Translation: he’s putting things together at this level. AND ANOTHER FUN FACT: Doughty ranks third on VCU’s team in defensive rebound percentage (17.2%) behind only Justin Tillman (24.4%) and Ahmed Hamdy (18.4%). The 6’4 guard isn’t without his freshman moments though. Doughty has a too-high 26.6% turnover rate through his two A-10 games and a 22.3% season rate (comparable players might be Treveon Graham who posted a freshman turnover rate of just 14.2%, Rob Brandenberg 12.4% as a freshman, Melvin Johnson 15.3%). He has at times taken more threes than is advisable for a now career 21.4% three-point shooter, but last night we saw what Doughty does best and how he can become one of VCU’s most dangerous players. 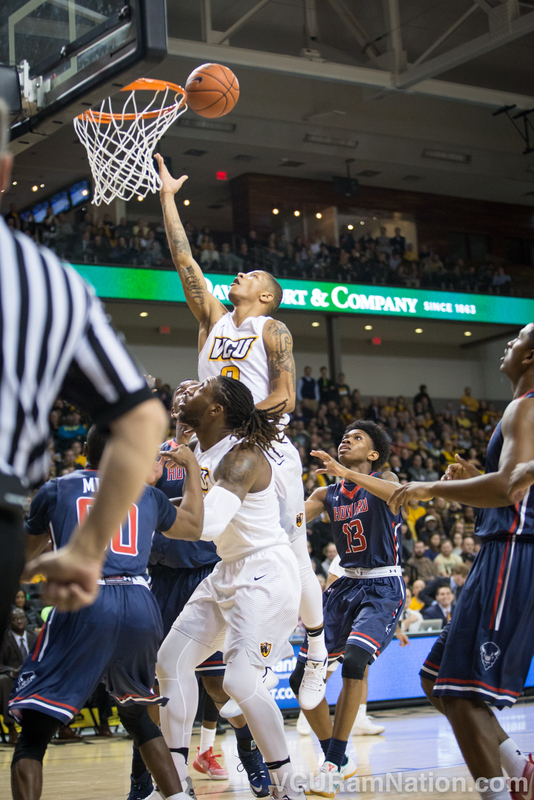 VCU freshman Samir Doughty is shooting 51.2% inside the arc on the season and 60% over two games of Atlantic 10 play. Doughty took a career-high 13 two-point attempts in the Rams win at Duquesne, finishing seven of those and getting to the free throw stripe to take advantage of his aggressive play offensively for three more points (3-4). He is an unbelievably crafty guard, hitting 60% of his two-point attempts in A-10 play and has finished 51.2% of his career twos. Combine that with a 73.2% free throw percentage and his assault on the basket is a well VCU should continue to go to and one opposing teams will hope runs dry sooner rather than later. Doughty’s game quite frankly can be a barometer for for VCU’s success as well. When Doughty and VCU are attacking the basket, they are generally incredibly tough to stop (see: VCU’s 60.4% two-point shooting on a season-high 52 attempts last night). When they settle for threes, sometimes things don’t go as planned, especially when coupled by high-turnover performances, which like this team in general, Doughty has fallen victim to at times this season. But with top-50 freshman De’Riante Jenkins shelved for the next six to eight weeks, expect to see plenty more of Doughty. At times we’ll see more of these explosive games (which, let’s be real, are pretty Maynor-esque) and we’ll likely have moments of frustration as well, as is to be expected from freshmen. But regardless, the kid has got “it”. Doughty plays with a swagger you don’t see from many freshman, but a swagger that will make an introductory tour of the Atlantic 10 an enjoyable one for Ram fans to watch.